The Conscience of a Liberal and The Return of Depression Economics and the Crisis of 2008, by Paul Krugman are both available on Amazon.com. Economics (2nd Edition), by Paul Krugman and Robin Wells is also available for purchase from Amazon.com. It took me quite some time, but I've added many of the transcripts (with links to video and/or audio in most cases) of Paul's TV appearances over the past five-or-so years. They're too numerous to list on this page (there are about 92 of them), so here is the list of the new transcripts sorted by section in which they are archived. I've also posted the video links in the Videos and Audio Secion, and here is the list of videos that are new. I've also updated the Books Section. 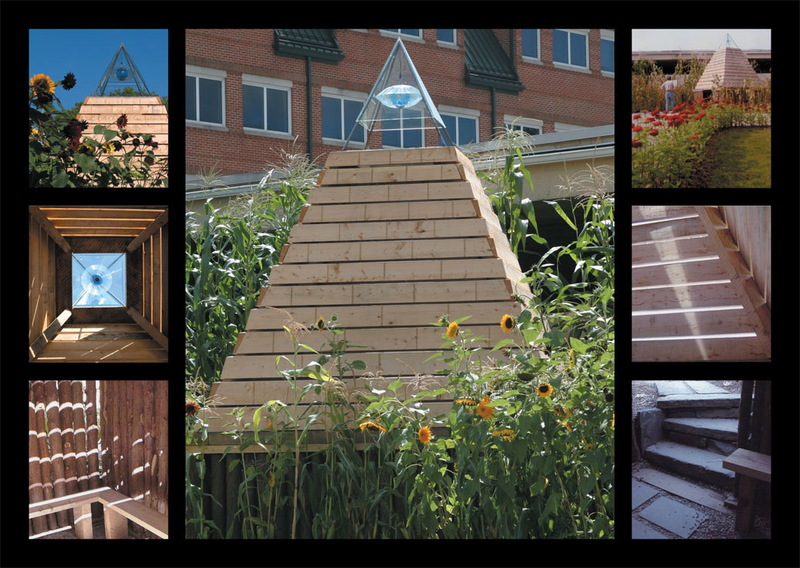 Check out Paul's new NY Times Magazine Building a Green Economy, which is archived in the American Economy Section. Hey Folks! Check out Paul's book review in The Guardian of Robert Skidelsky's Keynes: The Return of the Master, which is archived in the Economic Theory Section. Hey Folks! Paul has written a new New York Times Magazine article called How Did Economists Get It So Wrong?, which is archived in the Economic Theory Section. On Monday December 8th, from 9:00AM - 9:50AM U.S. Eastern time, Paul will deliver his Nobel lecture Increasing Returns. You can watch the webcast live at this link. Hey Folks! Paul has written a detailed overview of his thoughts on our current financial crisis in The New York Review of Books, which is in the American Economy section (Thanks to poster min on our new message board). We also have videos and transcripts from Paul's 12/3/08 appearance on the Hardball, with Chris Matthews (transcript and video), his 11/25/08 appearance on Countdown with Keith Olbermann (transcript and video), and his 11/24/08 appearance on the CBS Early Show (transcript and video). All of the transcripts and videos are posted in the American Economy section and Videos section. We have a new message board and Guestbook at the buttons in the upper right corner of this page, so please feel free to post. Finally, we have another picture of Paul with Bush, when the 2008 Nobel laureates visited the Whitehouse. Wow! Who'd've thunk this photo would ever exist? 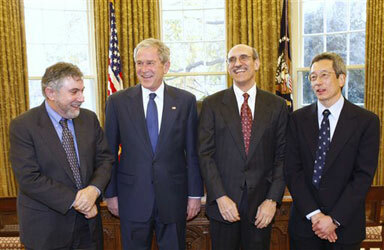 Paul meeting George W. Bush, as the 2008 Nobel winners visit the Whitehouse (Notice the AP article's inaccurate statement that Paul "opposed the recent $700 billion financial bailout." He supported its passage because time was running out but called for it to be fixed later on). Hey Folks! We have videos and transcripts from Paul's 11/14/08 appearance on David Gregory's 1600 Pennsylvania Avenue (transcript -- I can't find any video yet), his 11/16/08 appearance on This Week with George Stephanopoulos (transcript and video), and his 11/19/08 appearance on (the best news show on TV, I think) The Rachel Maddow Show (transcript and video). All of the transcripts and videos are posted in the American Economy section and Videos section. Congratulations to President-elect Barack Obama!!! His is truly the greatest electoral accomplishment in our country's history. I hope that he will be among our greatest presidents, like FDR and Lincoln, and our unfortunate circumstances domestic and abroad do afford him that opportunity. Now for updates: Paul was interviewed last Friday on Lou Dobbs Tonight, where they debated the amount of fiscal stimulus necessary to address our current financial crisis. The transcript and video are posted in the American Economy section and Videos section, respectively. Congratulations, Paul!!! Paul Krugman has won the 2008 Nobel Prize in Economics!!! The announcement page at the Nobel Site gives more detail. Also see Edward Glaeser's tribute to Paul for winning the Nobel. Hey Folks! Paul Krugman's new book The Conscience of a Liberal is coming out on October 15 and is now available to order online. I put a link to it at the top of the page! Anyway, check out the summaries of it from Amazon below. It is a very ambitious project and looks like it is going to be pretty amazing. Starred Review. Economist and New York Times columnist Krugman's stimulating manifesto aims to galvanize today's progressives the way Barry Goldwater's The Conscience of a Conservative did right-wingers in 1964. Krugman's great theme is economic equality and the liberal politics that support it. America's post-war middle-class society was not the automatic product of a free-market economy, he writes, but was created... by the policies of the Roosevelt Administration. By strengthening labor unions and taxing the rich to fund redistributive programs like Social Security and Medicare, the New Deal consensus narrowed the income gap, lifted the working class out of poverty and made the economy boom. Things went awry, Krugman contends, with the Republican Party's takeover by movement conservatism, practicing a politics of deception [and] distraction to advance the interests of the wealthy. Conservative initiatives to cut taxes for the rich, dismantle social programs and demolish unions, he argues, have led to sharply rising inequality, with the incomes of the wealthiest soaring while those of most workers stagnate. Krugman's accessible, stylishly presented argument deftly combines economic data with social and political analysis; his account of the racial politics driving conservative successes is especially sharp. The result is a compelling historical defense of liberalism and a clarion call for Americans to retake control of their economic destiny. (Oct.) Copyright � Reed Business Information, a division of Reed Elsevier Inc. All rights reserved. This wholly original new work by the best-selling author of The Great Unraveling challenges America to reclaim the values that made it great. With this major new volume, Paul Krugman, "the heir apparent to Galbraith" (Alan Blinder) and, today's most widely read economist, studies the past eighty years of American history, from the reforms that tamed the harsh inequality of the Gilded Age to the unraveling of that achievement and the reemergence of immense economic and political inequality since the 1970s. Seeking to understand both what happened to middle-class America and what it will take to achieve a "new New Deal," Krugman has created his finest book to date, a work that weaves together a nuanced account of three generations of history with sharp political, social, and economic analysis. This book, written with Krugman's trademark ability to explain complex issues simply, will transform the debate about American social policy in much the same way as did John Kenneth Galbraith's deeply influential book, The Affluent Society. Okay, here's an idea, which may seem ridiculous but can at least partially resuscitate the Haloscan Comments in the Columns Section. Nothing says that I'm not allowed to link to the Times's own password-protected web page that contains Paul's column. So I will link to it on the Columns Section front page, whenever a new column comes out. Unfortunately, you must be a TimesSelect customer and type in a TimesSelect password, in order to access Paul's column through that link. Below the link for each new column, I will put a link to a Haloscan comments thread, which is of course open to everybody. As you can see in the Columns Section, I've already done this for Paul's 9.23.05 column. Of course the same rules against readers posting TimesSelect columns, which I discussed in the last post, still apply. Andy Rosenthal called - they have apparently become aware of your site (I think too many bloggers gave the link) and asked me to drop a line asking you to stop providing the colum for free. Yuk. Therefore, I cannot continue to post his columns from The New York Times on this site. The Unofficial Krugman Archive has become a community over the past few years, and the center of it has been Paul's Times columns, where many of our regular readers have spent hours posting and discussing and enriching their knowledge and lives (as well as my own knowledge and life). In addition, I understand that many of our readers have already signed up for TimesSelect, but still come here for the conversation. Others among our readers have said that they have would have trouble affording TimesSelect, and that is a reason for coming here. To all of you, I am so sorry. The Columns Section will not be updated anymore, and I hope that they will let us keep the columns that are already there. In addition, I am afraid that I will get in trouble from this point on, if readers post the TimesSelect columns by Paul or the other Times writers on the Haloscan or Hotboards forums, so I would be grateful if you did not do that. As far as I know, the rest of the site outside of the Columns Section will stay in tact, and I will update them regularly. Again, I offer my deepest apologees, and I hope that our community can continue and thrive despite this. By the way, today is my birthday! I'm 25! Brad DeLong, you are a fool. Donald Luskin's claim to the "Stupidest Man Alive" crown cannot be shaken. The U.S. current account deficit has grown to an astonishing 6.5 percent of gross domestic product... This means that the nation is consuming around $700 billion more than it earns each year and paying for the difference by mortgaging or selling assets. Let us summarize the transaction. Chinese investors buy shares of IBM from us Americans. They pay us in yuan. We Americans take those yuan and use them to buy a bunch of frozen shrimp and a bunch of running shoes from producers in China. We eat the shrimp. We go jogging and wear out the running shoes. Next year the profits the shareholders of IBM earn are credited to some guys in China rather than to some of us. Our national product is thus reduced by the amount of the dividends and retained earnings credited to the foreign owners. We Americans are poorer in an income sense: the trade deficit-creating transactions have reduced next year's national product (and national product in every year thereafter). We Americans are poorer in a wealth sense as well: a greater share of IBM is owned by foreigners, and there is no compensating greater share of a foreign company owned by Americans. Donald Luskin--somehow--fails to understand this. I will not bother to observe that Luskin's quotes from the Post nowhere say anything close to "trade deficit necessarily entails debt creation." Hey Folks! Paul will be appearing at FDR's estate in Hyde Park, NY for an event commemorating the 70th anniversary of Social Security. All the info is below. HYDE PARK, N.Y. -- (BUSINESS WIRE) -- Aug. 3, 2005 -- On August 13, 2005, the Franklin and Eleanor Roosevelt Institute will host a birthday celebration marking the 70th anniversary of the passage of one of the most important pieces of legislation to come out of the New Deal -- the Social Security Act. The event will open at 10:00 a.m. and feature a talk on Frances Perkins's contribution to the development of Social Security by Kirstin Downey, of the Washington Post, followed by a debate on the future of Social Security between Paul Krugman of the New York Times and Michael Tanner of the Cato Institute, moderated by James Roosevelt, Jr., grandson of Franklin and Eleanor Roosevelt, and a former Associate Commissioner of Social Security in the Clinton Administration. The debate will be followed by a picnic lunch on the grounds of the estate between 12:30 and 1:30, followed by a formal program of music, reminiscences, and remarks, led by the Commissioner of Social Security, Jo Anne Barnhart, James Roosevelt, Jr., and Lou Glasse. The afternoon program will also include a special tribute to former Social Security Commissioner Robert Ball, and music by the well-known Hudson Valley musicians, Randall Wallace, grandson of Henry A. Wallace, Jay Unger and Molly Mason. At 3:00 p.m., Commissioner Barnhart and James Roosevelt will join others in cutting a commemorative Social Security birthday cake that will be shared with the more than 1,000 guests expected in attendance. Between 3:00 and 5:00, following the formal program, members of the new student think tank, Roosevelt Institution, will host a special "Hyde Park Corner," in honor of the first of FDR's Four Freedoms, Freedom of Speech and Expression, where members of the public will be given the opportunity to express their views on the day's events. Simultaneously, further reminiscences from some of the early recipients of Social Security will be held inside the Wallace Center, filmed and open to the public as part of the Institute's on-going efforts to catalogue the legacy of the New Deal. Hey Folks! Paul will be on The Al Franken Show today, which airs from 12Pm - 3PM today. He is on exactly at 12PM. You can listen by clicking on the link above, and I'll archive the audio of the show when it's ready! Hey Folks! I'm sorry that I was so late in posting Paul's 5.23.05 NYT column. That day, I had my college graduation from Yale! Of course, as always, I will post his columns here as soon possible (and almost always on the same day). Check out the new Krugman/Wells Microeconomics Video Center, which has videos of Paul Krugman and Robin Wells discussing each chapter of their new text book Microeconomics. They are very fascinating to watch. The link to the video center is stored in the Video and Audio Section. Social Security: Is It Really a Crisis? New York Times columnist Paul Krugman, Cato Institute analyst Michael Tanner, and Joshua Micah Marshall of Talking Points Memo participate in a debate on Social Security at the New York Society for Ethical Culture. Visit The Social Security Network at www.socsec.org to learn more about Social Security and its future. Seating is limited and there are no reservations so be advised to arrive early. For more information contact: Christy Hicks at hicks@tcf.org or 212/452-7723. Hey Folks! We have the audio clips of Paul's 2.16.05 appearance on NPR's Fresh Air and his 12.16.04 debate with Stanford's John Shoven on NPR's On Point. 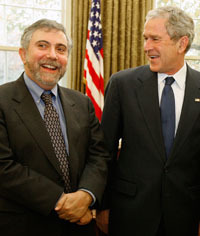 Finally, we have the audio clip of a 8.23.04 debate on NPR's The Connection between Krugman and . . . yawn . . . Stephen Moore. The first two are about Bush's Social Security dismantlement plan and the last one was made before the disastrous 2004 election and is about that. We also have audio clips Paul's appearances on Wisconsin Public Radio's Ideas Networks from 1.12.05 (discussing Bush's Social Security dismantlement plan), 11.5.04 (discussing the outcome of the election whose name will not be spoken -- well, except for that one mentioning above, but that's the last time), and 8.25.04 (where they discuss the election). Hey Folks! We have four new written items with Paul today, all on Social Security. Paul posted a note regarding his 2.4.05 NYT column, which I just appended to the end of the column (scroll to the bottom). In its original form, this note was a letter from Paul to Atrios posted on Eschaton. We also have the videos of Paul's 2.3.05 debate on Democracy Now! against some guy from AEI (the link for this one is not working quite yet but will soon) and Paul's 12.21.05 interview on Democracy Now! . The topic of discussion for both is -- you guessed it -- Social Security! I've also put up a permanent Amazon.com link for Microeconomics, by Paul Krugman and Robin Wells, which is available for purchase now. March 15: Century Foundation and New York Society of Ethical Culture, New York City. Happy New Year! Okay, I know that's pretty ridiculous at this point. We've been running low on non-NYT-column-related Krugman stuff lately but we have three new things for today, and updates will come more frequently. But first, I'm afraid that I have probably missed quite a few Krugman-related things on the web during this time. The purpose of this site is to be comprehensive, so if you find any Krugman-related items that aren't already posted on this site, please email me at: robert@pkarchive.org (Also email me if you get another Happy New Year that comes later than mine). If you haven't seen it already, check out Paul's note on yesterday's column, which I very imaginatively posted at the end of yesterday's column on Bush's lies about Social Security and Black life expectancy. This note came originally as a post on Brad DeLong's Blog (though you have to search hard to find it in this original version). Disclaimer: I cannot attest to whether Paul actually wrote it, and I will take it down if it turns out that it was someone posting falsely under his name. Paul also wrote a quick note at Josh Marshall's Talking Points Memo about the WSJ editorial page lying with statistics in order to understate future deficits due to Bush's tax cuts, which is in the American Economy Section. My thanks to readers Emma and Terri, who really have eagle eyes, for these last two. This will be a debate on the need for social security reform and White House economic policies in the wake of President Bush's State of the Union address. Panelists include Senator Jon Corzine (D-NJ), Senator John Sununu (R-NH), and, of course, economist and New York Times columnist Paul Krugman. Oh yeah . . . Stephen Moore of Club for Growth and Cato Institute will be on the panel too. (Can't they get some higher quality conservative economists? They are so easy to find. At least two of my three economics profs this term are conservatives and Bush supporters, and I guarantee that they both are lightyears out of Stephen Moore's league. And if either of you two are reading this, please give an A to . . .). The panel will be moderated by Bob Carden, chair of the Forums Committee. Finally, I've upgraded the Haloscan Boards for the site. The character limit on postings therefore goes up from 1000 to 3000. Also, now that we have an upgraded account, all of those more-than-3-month-old Haloscan boards which you may have thought were erased, should all be back on the site within 24 hours. Hey Folks! We have a new in-depth article on Social Security in The Economists' Voice, which is a new economics magazine by Joseph Stiglitz and Brad DeLong (visit it here). We also have the transcripts of Paul's 12.27.04 appearance and 12.14.04 appearance. All three of these are in the American Economy Section. Finaly, if you don't think our government is stingy with foreign aid, read Paul's 12.25.01 NYT piece The Scrooge Syndrome. As well as being a distastrous tragedy, the earthquake and tsunamis also happen to give our government an opportunity to make a good impression with Muslims in countries like Indonesia. If done correctly and sufficiently generously, our aid efforts could do far more to prevent terrorism than the Iraq war ever hoped to achieve. We have missed so many opportunities already in this war on terrorism. Let's not squander another. Hey Folks! Don't miss Paul's newest column on Social Security, which is out today, which is in the NYT Columns Section, as always. Hey Folks! Paul made an 11.23.04 appearance on Marketplace talking about our twin deficits, and this is in the Video and Audio Section. We also have a new Reuters interview with Paul where he discusses economic crisis, which is in the American Economy Section. Imagine that some state wants to create some government program at the state level (We'll call this state the "donor state" for reasons you see later). The federal government itself won't do that program nationwide because it is already running huge deficits and ready to largely cut existing programs to the bone in Bush's 2nd term. This "donor state" that wants to create the program at the state level is unwilling to raise the necessary state taxes needed to to fund it, because people and businesses seeking to avoid extra taxation will move out to neighboring states, thereby partially frustrating the effort to raise revenue. The solution to this is that the donor state agrees with neighboring states to raise taxes by the same amount (We'll call these neighboring states "recipient states" for reasons we'll see in a moment). Since these neighboring "recipient states" *and* the donor state all raise their taxes by the same amount, there are fewer attractive lower-tax places for people and businesses to go, so fewer people and businesses move out of the donor state under this higher taxation. This donor state can entice other "recipient states" to cooperate and raise their taxes by creating a revenue-sharing consortium, under which these "recipient states" get back more revenue than they put in. This consortium is effectively a mechanism by which states make side payments to others in order to get cooperation. All these states form a consortium, in which they all levy a certain extra tax, say, equal to x% of income (I'm doing a flat % here, but this can be done with marginal rates too). These member states set their own state income taxes independently. But this separate x% tax on income must be uniform across states that are members of the consortium. Therefore when people pay taxes at the state level, they pay their regular state income taxes plus the extra x% of their income for this extra tax. Then the revenues from this x% income tax are pooled from the different member states and redistributed according to some pre-negotiated distribution formula among the member states. 1. The donor state (which is the one that originally wanted to create the program at the state level) gets back less than it contributes to the revenue pool, according to the distribution formula. This is the cost of the consortium to the donor state. The benefit they get from the consortium is fewer residents and businesses moving out of state due to higher taxes. Therefore, the donor state uses the revenue they get back from the revenue pool to fund the government program they wanted. 2. The other states (that is, the recipient states, which are the other members of the consortium) agree to join the consortium and raise their taxes by the same amount as the donor state. Their incentive to join the consortium and raise their taxes is that, under the distribution formula, they receive more from the revenue pool than they put in. Without this incentive, there would be no reason for another state to raise his taxes to the same level of the donor state. Depending on the rules of the consortium, recipient states can use this revenue from the revenue pool to pay for either the same government program that the donor state is implementing, a different specified government program, or they can use the revenue however they want at their discretion. Finally, the rule is that, if a state lowers its x% tax below that amount of x%, it gets kicked out of the consortium for some temporary period and must pay some penalty money to other states. This is the mechanism by which it is enforced that the x% tax rate is the same across member states. It would be better to come up with more detailed penalties for states that lower the tax below x%, in order to ensure their compliance. This idea is very flexible in its implementation. It can be modified to include several donor states and any number recipient states. The differential between the amount any state contributes and gets back from the revenue pool can be very large or very small, depending on the specific distributional formula that is negotiated. It can also be applied to many different policies. It also leaves open the possibility of coordinating programs across the member states or having the states run their own programs individually. For example, if the federal government were to abolish or somehow destroy Social Security, these states could create a (partial) substitute for it by forming a consortium, pooling revenues, and then redistributing money from the revenue pool to the retired residents of member states according to some distribution formula. Specifically, I would like to see New York enter a consortium with neighbors, in order to get far better port security, which I am sure that Bush will ignore in the next few years. Environmentally conscious states can also enter consortiums where they all levy the same gasoline tax or environmental regulations, and they entice other states to join by making side payments to them (either through the revenue pool in the case of the gas tax or some other mechanism in the case of regulations). This obviously doesn't work too well for things like global warming. I'll add some qualifiers here. Whether the consortium works and the optimal design of it depends on various empirical relationships and sensitivities between variables. For example, the sensitivity to taxation of people moving out of state might be very small. That is, if people moving out of state is very insensitive to taxation, it may be beneficial for the donor state to run the program by itself instead of starting a consortium with other states. Also, you might need to create a very large consortium in order to decrease significantly the number of businesses and people who move out of state under higher taxes. Please read Josh Marshall's comment on the election in its entirety. Hey Folks! I just wanted to post a pre-election message. I really think there are three pivotal states in this election: Wisconsin, Ohio, and Florida. Whoever wins two out of these three wins the Presidency. Here's my reasoning (only my opinions -- feel free to disagree): Bush will pick up Iowa and New Mexico and win all of the 2000 Red States, except New Hampshire which he will lose to Kerry, and Ohio and Florida which are uncertain. Kerry will definitely pick up New Hampshire and win all the 2000 Blue States, except Iowa and New Mexico which go to Bush, and Wisconsin which is uncertain. You can check for yourself what I just said: Here is the Election 2000 Presidential Election map. For Election 2004, you can calculate the number of electoral votes for Bush and Kerry under different scenarios, using Daily Kos's electoral calculator. You can see state-by-state polling numbers for Kerry and Bush here and here. 2. Second, national media coverage does affect the presidential race in each state. Please write in to national television media outlets, both on cable and the networks. Say whatever you think it takes to set their pro-Bush-anti-Kerry coverage straight. Here are links to email contact info and phone contact info for the various national media outlets. For example, Kerry is right in arguing that Bush screwed up Osama bin Laden's capture at Tora Bora by outsourcing the job to Afghan warlords. Kerry is also right in criticizing Bush for saying of bin Laden that he is "not concerned about him." Now television media is saying that Kerry is somehow "exploiting" the recent bin Laden tape when he makes these arguments. 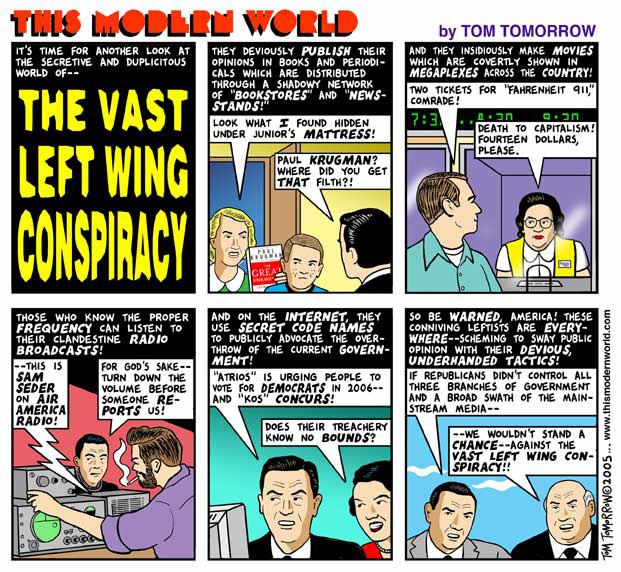 This is an obvious attempt to manipulate public opinion in favor of Bush. Again, I know that writing and calling in to these media outlets is time consuming, but look below at how close Ohio, Florida, and Wisconsin are, and you will see that your contribution could make the difference. Hey Folks! Paul is going to be on Charlie Rose next Monday debating Bob Barro, November 1, the night before the election! Please watch and tell all your friends in Ohio, Florida, and Wisconsin to watch too! Hey Folks! Above, I put up a permanent link to our new page of all of our Pollkatz-style graphs of the 2004 U.S. Presidential Election polls for the national race, Florida, and Ohio. It has all the polls and says when each graph has been last updated. I also made two new graphs for the national polls, which show, at each date, the average of all polls taken in the past two weeks and the median of all polls taken in the past two weeks. Okay. . . For some reason, the HotBoards message board is back, so please just disregard what I said before about it being gone. Sorry about that. Also in usual cowardly form, Luskin ducks DeLong's criticism of his ridiculous mistake regarding the first graph in his NRO article. First, Luskin says that he doesn't understand DeLong's criticism, which means he's either being dishonest or is severely lacking in intelligence. Personally, I think this is a transparently dishonest copout. Then, without acknowledging his mistake, Luskin basically tries to deflect attention away from that first graph, which he dares not defend, and claims that the rest of his article is right. It's ironic, to say the least, that this dodge comes from someone who's career consists of ignoring 95% of what Krugman actually says and then self-righteously (and usually dishonestly) calling on Krugman to issue corrections for the smallest of perceived innaccuracies. That NRO employs this hypocrite as a fact-checker is just one more of many stains on the intellectual honesty of National Review, and, by extension, the conservative movement. And of course, still no correction from Luskin on his upside-down real exchange rate graph (scroll down to read about this). Advice for National Review: Reassign Luskin to some section of the web site outside of economics, one for which he's qualified (this could be difficult since Luskin has shown so far that he is only qualified to threaten lawsuits and write unfunny diatribe). Hire Robert Barro, Robert Lucas, Martin Feldstein, or even Glenn Hubbard or Michael Boskin. Unlike Luskin, they have knowledge of economics, and their potential to deviate from intellectual honesty is at least somewhat restrained by the prospect of embarrassing themselves among their academic peers. If National Review would replace its hatchet men with actual economists, perhaps it and conservatism could get back some of their dignity. We've got the transcript of debate with George Will on This Week, which is in the American Economy Section. When it aired this Sunday, I just turned it off right at the beginning, since they had John O'Neill on, and the site of him sickens me. Speaking of smear artists, Luskin still hasn't said anything about his idiotic mistake in NRO on income changes among different income groups. And, again, where's Luskin's correction on his upside-down real exchange rate graph? Also, the appalling incompetence of National Review's economics team continues. Stephen Moore and, as always, Donald Luskin* continue to mislead their readers. At long last, we have the MP3s of all four of Paul Krugman's appearances so far on The Al Franken Show in our Videos and Audio Section. Krugman appears on the 8.10.04 (where they discuss Krugman vs. O'Reilly in depth), 8.3.04, 7.20.04, and 4.2.04. From now on, we'll post the links to the audio of Paul's weekly appearances on The Al Franken Show each week when they are available. These links all come courtesy of Air America Place, which has archived all of the audio from Air America Radio. It's a wonderful site, so please pay them a visit. We've got several new videos and audios (?) today, some new and some old. Paul is promoting the paperback version of The Great Unraveling, which you can buy from Amazon at the link above. Hey Folks! We've got a new Media Matters clip of Krugman vs. O'Lielly, which is archived in the Videos and Audio Section. I'm also fairly sure that video of the full program will be available soon. Finally, don't forget to tune in to The Al Franken Show, where Paul Krugman will be a guest discussing the debate with O'Reilly. It airs today 12PM to 3PM and is repeated tonight 11PM to 2PM. Just click on the Air America Radio audio link above to listen. Today, Paul Krugman walks into the heart of the storm and debates his most prominent conservative critics, and we have the transcripts to prove it. Sorry about being so late with Krugman's NYT column and not being on the ball in general this week. My laptop has been at IBM all week for repairs, so it's been difficult to get internet access. I'm on one of my parents' computers right now, but everything will be back to normal once I get it back this week. Also, we'll have the transcript of Krugman versus O'Lielly from Tim Russert in a few days. But does anyone have video of it that could be streamed? I only found out about it only today, so I haven't seen it, and, from what I hear, a transcript alone isn't likely to do justice to it. Meanwhile Media Matters brings us this clip of an exchange between Paul and O'Reilly, which is in the Video and Audio Section. Hey Folks! Paul's going to be on The Al Franken Show today, which airs at 12 noon and is repeated tonight at 11PM, so click the Air America Audio link above to listen! Off topic, I am so proud that John Kerry is our candidate for President after his wonderful acceptance speech last night! Hey Folks! Luskin finally released the second page of the 1980s inflation memo. Luskin released each page as two separate ".pdf" files, and I don't have the software at home, so I have to go to my college computer cluster later today or tomorrow, and then I'll post it as a single file in the American Economy Section. For now, here are the first and second pages. Now, let me briefly address DeLong's nitpicking of my critique of the Krugman/Summer's inflation forecast. DeLong claims that I used the wrong data definition to fact-check Krugman and Summers' forecast that "As real interest rates decline and the economy recovers, we can expect the real exchange rate...to return to approximately their historical levels." Krugman and Summers defined "historical levels" by stating "The real exchange rate is now...23.7 percent above its average level during the period 1973:1981." DeLong defines the "real exchange rate" as "to divide a nominal exchange rate series by...the ratio of the home to the foreign price level." The problem is that when you use that definition, then Krugman and Summers' 23.7% "historical level" is wrong. Using the Federal Reserve's Price-adjusted Broad Dollar Index series constructed DeLong's way (endorsed as the correct series by no less an economic authority than "Bobby" -- the keeper of the online Krugman shrine -- in the process of crowing about DeLong's defense), we see that at the time Krugman and Summers' forecast was written, the real exchange rate was in fact only 18.2% above its "historical level." The series I used, which (in DeLong's words) was "to divide a nominal exchange rate series by the home country's price level," and to see it from the perspective of the foreign currency rather than the dollar -- came a little closer to Krugman and Summers' number, at 28.5%. Obviously I had no idea what series Krugman and Summers really meant, or from what perspective they intended it to be viewed -- and either [sic] does DeLong. So I picked the series and the perspective that made more sense in relation to Krugman and Summers' own numbers. Did I guess wrong? Did DeLong? Who knows. All I know is that DeLong counts my guessing differently from him as among my "sins." I thought economics was a science, not a religion -- but then perhaps this explains why DeLong always refers to Krugman as "Brother Paul." First, let's deal with Luskin's mistakes about the real exchange rate in his NRO article, for which he owes his readers a correction. The problem is that his "guessing differently" is *not* the definition of the real exchange rate. The real exchange rate has a single, fixed, and well-known (except to Luskin) definition in economics, which can be expressed in two ways. First there is home currency per unit of foreign currency times the foreign price level divided by the home price level. Second there is the reciprocal of that number. Either way you must multiply and divide by *foreign and domestic price levels*, not just one of them. Since Luskin only multiplied by one of those price levels, that means one of two things. Either Luskin does not know what "real exchange rate" means, in which case, as I suspect, he's not qualified to be an economics commentator. Or he is lying and hoping his readers are too ignorant to notice. I think we can take it as a given that, unlike Luskin, Summers and Krugman actually know the correct definition of the real exchange rate. So Luskin's weasel-like claim that "Obviously I had no idea what series Krugman and Summers really meant . . . Did I guess wrong? Did DeLong? Who knows" is obvious b.s. Whatever real exchange rate index Summers and Krugman had in mind, at least it must have followed the actual definition of the real exchange rate, unlike the garbage Luskin made up for his NRO article. We can see Luskin's mistake more clearly with graphs. The second graph below is the one from Luskin's NRO article, which he falsely claimed to represent the real exchange rate. The first graph below is the "correct" data on the real exchange rate from the Fed's Price-adjusted Broad Dollar Index (it is "correct" in the sense that, unlike the nonsense concocted by Luskin in that second graph, it actually *follows* the correct definition of real exchange rate). Compare the two graphs. If you take the data in the first graph, then flip it vertically, tilt it upwards, and stretch it, you get the second graph. So Luskin *almost* had correct data, but screwed it up. First, he screwed it up by multiplying by one price level and forgetting to divide by the other one, creating a meaningless time-series. This is where the upward tilt and stretch come from. Now let's look at the flip. Even if his data had correctly shown the real exchange rate, Luskin still didn't realize that, since his data was supposed to be real dollars per real unit of foreign currency, an increase was real depreciation while a decrease was real appreciation. Also, the unit on the vertical axis of the second graph is *1982 dollars*, so, again, up *must* mean real depreciation and down must mean real appreciation. Luskin, however, fails to realize this very elementary point. In his article he incorrectly interprets "up" on the second graph as real appreciation and "down" as real depreciation. He owes his NRO readers a correction for all of these mistakes as well as an apology for his incompetence and lack of economic knowledge. Finally, Luskin makes the excuse that the Price-adjusted Broad Dollar Index showed real exchange rates at 18.2% above the 1973-1981 level (I'm going by Luskin's numbers here so believe them at your own risk). This didn't match the inflation memo, which said that, in September 1982, the real exchange rate was "23.7 percent above its average level during the period 1973:1981"? Therefore, Luskin made up his own nonsense variable, which happened, in September 1982, to be 28.5% above its own 1973-1981 level. So the Price-adjusted Broad Dollar Index is 5.5% below the inflation memo's estimate, while Luskin's made-up variable is 4.8% higher. Therefore, in order to decrease the error by .7%, Luskin makes up his own nonsense variable, which doesn't even come close to capituring real exchange rate movements. And with that nonsense variable, which is not the real exchange rate, he excoriates Krugman for misforecasting the real exchange rate. Must one explain why this is a very stupid thing to do? Personally, I think Luskin's excuse is a bad lie to cover for his shameful ignorance of the definition of a basic economic variable. Judging from his usual pattern of incompetence, I also suspect that Luskin didn't even know about the Price-adjusted Broad Dollar Index until he read about it on this site. In the graph above, the green point denotes the real exchange rate in September 1982. Real exchage rates rose sharply after that, peaking in March 1985 and fell. Real exchange rates appear actually to have returned to "approximately their historical levels" by 1988 and stayed there for the next nine years. So Luskin could have criticized the memo's real exchange rate forecast for two things: first that the real exchange rate forecast took six years to pan out, and second, maybe that there was a mistake involved in that discrepancy. Again, his NRO article would have been less exciting but more honest. In his blog post mentioned above, Luskin *is* of course making these argments now, but only because he has been so thoroughly debunked they are all that is left of his shattered critique of the real exchange rate forecast. The error still stands in his NRO article, and he must make the correction there. BTW, the video of this is just a link to a video file from C-SPAN.org, which, I believe, will take the file off their site within the next few weeks, thereby not allowing us to see it thereafter. Does anyone know where I can find another video file from a different site? The chart below shows the real exchange rate of the US dollar for a decade before the 1982 memo, and then through the end of the Reagan presidency. It did drift slightly lower for the first couple of years after the memo. But then it took off to new highs -- nothing resembling anything like a "return to approximately their historical levels." The memo was written in september 1982, which is denoted by the green point in the graph above. Real exchage rates rose sharply after that, peaking in March 1985 and fell. Real exchange rates appear actually to have returned to "approximately their historical levels" by 1988 and stayed there for the next nine years. It is with this data, and not the rubbish concocted by Luskin, that one should judge the accuracy of the forecast. Also if one looks just at the dates 1973 to January 1990 (below), the same dates as Luskin's graph, one notices that the two graphs look very different. The difference appears to be consistent with Luskin taking the reciprocal, that is the price of foreign currencies measured in dollars, of the number he wanted. Then it also appears to be consistent with multiplying by some price level and failing to divide by another. It's likely that he multiplied by the U.S. price level, since, unlike the composite price index of the relevant foreign countries, it's readily available. Of course, since his nominal exchange rate is the price of foreign currency measured in dollars, he should be dividing by the U.S. price level and multiplying by the composite foreign price level. Anyway, it appears Luskin really really screwed this one up. I've criticized his lack of competence as an economist before, but he really outdid himself this time. We're awaiting a correction in NRO. Alright, we got a response from Luskin, saying he doesn't have the rest of the memo. In his original post, he says he got that original one page from Bruce Bartlett. Does Bartlett have the other pages? If so, please ask Bartlett to release them! Also, if Luskin doesn't have the memo in its entirety, and therefore I'm inferring he never actually read the *entire* memo, why didn't Luskin make it clear in his original post that he was going only on limited information? Luskin says "Today he explains the collapse of inflation as being solely due to Federal Reserve chair Paul Volcker and his "tight money policy." . . . Either way, it's a stark contradiction to his position in the 1982 memo that the Fed's policies produce only "temporary side effects." Here, inflation decreases either due to (a) decreases of expected inflation or (b) increases of the deviation of unemployment from the NAIRU. If Volcker's tightening had achieved mainly (b) and not much of (a), most of the inflation would have returned once unemployment went back down to the NAIRU. In mid-1982, Krugman thought the recent low inflation at the time was mainly due to (b), so this was the source of his worry about the effects of Fed tightening being "temporary." Therefore the theory accomodates both Krugman's 1982 interpretation, which was likely incorrect, *and* the actual outcome. In 1982, it was too early to tell whether inflationary expectations had been significantly tempered or the disinflation was mainly cyclical. Under this uncertainty, Summers and Krugman merely asked, "In what direction do the risks lie?" and gave advice accordingly. Luskin then says, "In 1982 Krugman thought inflation was caused by the exchange rate of the US dollar, the price of commodities, and the price of oil. But as anybody with a lick of common sense could tell him, he had it completely backward -- these things are the effect of inflation, not its cause." Has Luskin ever heard of cost-push inflation? Is he prepared to say that the oil shocks in the 1970s weren't inflationary? Anyway, in reality, these prices are all "causes and effects" of each other. Remember that we are dealing with general equilibrium here, not partial. All these prices are determined simultaneously in a system of equations that characterize equilibrium in all markets. Finally, Luskin at least suggests that this memo is an example of "failed theories." The forecasts of the future values of real exchange rate changes, commodities price changes, oil price changes, and expected inflation were incorrect. However, why is this such a sin? These future values are very difficult to predict with today's techniques, much less those of the early 1980s. Summers and Krugman did their best by using historical data for commodities prices and real exchange rates, noting that they were far different from historical averages. Again, they also asked themselves, "In what direction do the inflationary risks lie." The risks lay in greater expected inflation, a weaker real exchange rate, and greater oil and commodities prices, and, as risk averse economists, they made their forecast accordingly. With the information available then, what would Luskin's strategy for forecasting these variables have been, aside from blind faith in the Gipper? Whenever an economist does an ex ante forecast of some variable, he runs many risks, one of which is that the future values of exogenous variables are wrong thereby ruining the ex ante forecast. This probably happened in this particular forecast. In forecasting inflation, Summers and Krugman likely took future values of real exchange rate, commodities price, oil price changes, and expected inflation as exogenous to their inflation forecasting model. If so, is clear that Summers and Krugman came out on the bad side of that particular risk [It could also be that the exogenous variables were something else and guesses of their future values were off]. We know that the ex ante prediction of inflation should fail because we are substituting into the forecasting model different exogenous variable values from those that would yield the correct inflation rate if the model were sound. These incorrect exogenous variable values make the model fail regardless of its validity. Therefore, one can't conclude yet whether the ex ante failure implies a failure of the model itself. Even if the model were flawed, one especially does not have sufficient information to say this is due to the underlying economic theory, as opposed to some other problem like specification of functional form, data mining, or other econometric pitfalls. One wonders whether Krugman and Summers' forecasting model gets closer to actual inflation with an ex post forecast. That is, if one substitutes into the model the actual values of the exogenous variables, which we know since since they have already occurred. Regardless, it's a cliche among economists, in and outside of academia, to say that they are notoriously bad at forecasting. With this fact in mind, Luskin's criticism is basically unimportant as a reflection on Summers or Krugman's quality as economists. Also, I was wondering why Donald "Hinckley" Luskin has released only one page of the memo Paul and Larry Summers wrote back in the 1980s entitled "Inflation During the 1983 Recovery" ("The Inflation Time Bomb" is the name of a subsection of it and not the title of the memo as Luskin claims -- Liaaaar!*). Anyway, since I'm sure that Luskin has nothing to hide, I'm calling on him -- and his friend Bruce Bartlett, who apparently gave Luskin that first page -- to release the memo in its entirety. Hey Folks! From now on I'm going to put up a blog-like comments section on each new Paul Krugman piece that we get, including the NYT Op-Eds. So far I've only put up one, and that's for Paul's latest NYT piece, and I'll put in one for the new one coming out tonight. For now I'll only install comments sections for new Krugman articles, but if it's successful, I'll try to install comments sections on older articles too. Of course this new feature is a supplement and not a replacement for the message board. By the way, if you really want to beat Bush, and if you have a website and you are able, please put a permanent and *prominent* link to Air America Radio's live audio feed on your site, just like the one I did above. If more websites do this, more people will remember to listen while they surf the web, and this will help liberal radio towards getting a strong base of listenership. 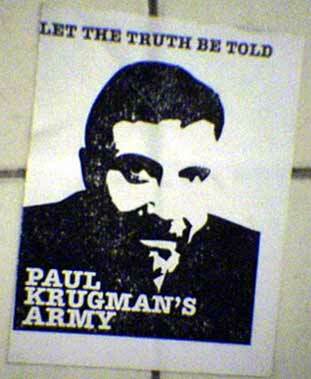 The Unofficial Site wishes Paul Krugman a happy 51st birthday!!! Hey Folks! Sorry, I forgot to tell you on the updates page that about six of the seven pieces at the top of the American Economy Section are new, so please check them out. We've got the audio of Paul Krugman's 1.12.04 speech at the Commonwealth Club of California, broadcast on Minnesota Public Radio. Also, look what I found on Daily Kos. This poster was in the subway station in Times Square. I think it would make a great T-shirt in case anyone wants to make one.